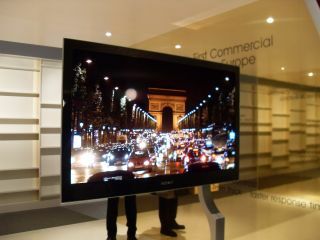 Sony showing off 21" XEL-2 OLED TV? Those of us waiting patiently for the successor to the million pound crown worn jauntily by the XEL-1 OLED TV from Sony could have a little less time to wait after a 21-inch set was spotted in Japan. The Japan Display 2009 Event (possibly sponsored by Ronseal) had visitors flocking to the Sony stand to see the ultra thin OLED TV they had on show, and has led some to believe it's likely to be the XEL-2. The unit on display was merely 1cm thick (10mm in alternative speak) and rocks a 1366x768 HD resolution, which you'd expect from unit that would probably cost more than £4000 when released. However, Sony has shown a number of super-thin OLED concepts before (for instance at IFA last year where TechRadar managed to bag some decent shots of the bigger screens. Is the XEL-2 coming or not? On the one hand, we were told last year that a 27-inch model was being readied for a worldwide launch in 2009, with even bigger ones coming after that. But recently, Darren Ambridge, Sony's Group Product Manager for TVs, told us that "Sony is focused more on big-screen technology at the moment," so it seems unlikely that a new larger OLED TV is hitting the market any time soon. Especially as the cost of the XEL-1 was so high due to the high cost of manufacture, although Sony has apparently developed a 'new way of producing the OLED'. Suppose we'll just have to wait and see again. Looks like it will be ages until the cost of the thin and vibrant OLED tech drops to a low enough point to entice us away from LCD.